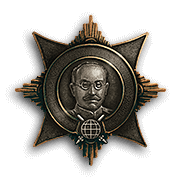 The 9.2 Update has introduced a new award for clan members currently fighting for dominance on the Clan Wars Global Map. 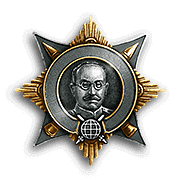 Known as Rotmistrov's Medal, this achievement will serve to inform your peers about your accumulated experience fighting for your clan on the Global Map. If there ever was a veteran of war, Pavel Alexeyevich Rotmistrov would be that person. Born a decade or so before the outbreak of World War I, Rotmistrov began his military career at the tender age of 18, right in the middle of the Russian Civil War in 1919. His first forays into the battlefield was amongst the infantry corps, serving as commander of a rifle platoon first, then subsequently the entire company. Some years after the conclusion of the Civil War, he began serving in military academies in the Soviet Union. Rotmistrov's first interaction with armoured vehicles came when he became Chief of Staff of the 3rd Mechanized Corps in 1941. The Second World War began soon after that, ushering a rapid series of events for the man who had - at this point - already seen over 20 years in service. His exploits during World War Two did not go unnoticed, although some of them were not looked upon favourably. As commander of the 5th Guards Tank Army, Rotmistrov participated in the Battle of Kursk and Operation Bagration. It is theorized that the subtantial losses incurred in these two engagements prompted his superiors to remove him from command of all active units. Although he was stripped of all chances to participate in actual combat, Rotmistrov continued to serve the Soviet military in a position of command. Promotions continued to follow; he was promoted to General Colonel in 1943, and appointed Marshal of Armoured Troops the following year. 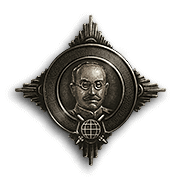 After the War, he took control of the armoured forces residing in Soviet-held East Germany, and afterwards the assistant Minister of Defence for the Soviet Union. Pavel Rotmistrov died in April 1982 while serving the Ministry of Defence as an Inspector-Councilor, dedicating his entire life to the military.